On August 15, the City of Reading recognized and celebrated employees in the Public Works department who have completed 30 years of service or more with the City. 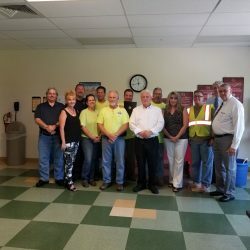 Twelve employees were recognized at a luncheon at the Public Works building on North 6th Street, where Wally Scott, The People’s Mayor, thanked each employee on behalf of the people of Reading and presented each with a certificate of recognition. Ralph Johnson, the Public Works Director, also shared works of appreciation. Employees recognized for their commitment and exceptional service include Richard Kasprzewski, Equipment Operator II; Joseph Carl, Equipment Operator III; Jeffrey Hill, Environmental Program Coordinator; Stephen Chmura, Maintenance Supervisor; Richard Sassaman, Tradesman-Plumber; Patricia Tezak-Angstadt, Secretary; Lester Kissinger, Equipment Operator II; Tammi Moyer, Maintenance Worker II; Christopher Elia, Streets Department Foreman; Johnny Oyola, Maintenance Supervisor; Tami Schaeffer, Confidential Secretary; and Karen Intelisano, Equipment Operator II. Each employee has demonstrated experience, dedication and commitment to the City of Reading by putting residents first; helping to enhance the quality of life in our community, and exemplifying our core values of respect, responsibility, accountability, and an openness to diversity and new ideas.